The University Career Center is excited to introduce you to a tenacious leader and role model, Sahil Maherali! Sahil has gone above and beyond as a UTSA Roadrunner, completing 4 college internships and mentoring peers in their pursuit of internships as well. As a Communications major with a minor in Business Administration, Sahil is an active member of Alpha Kappa Psi and diligently works for the Center for Student Professional Development. Throughout his time at UTSA, Sahil has pursued countless opportunities to develop as a young professional and coach students to do the same. In 2018, he participated in Internship Week’s Spring Networking Mixer as a Mentor, leading a group of students in exploring internship “search strategies”, and facilitated an Internship Preparation Workshop in the Fall. Sahil was one of fourteen presenters for the Career Center’s Internship Expo in August 2018 and facilitated Internship Preparation workshops for 3 Career Planning Classes. Sahil has excelled in sharing his internship journey and has led the charge in preparing peers for internship success as well. We are thrilled to highlight Sahil this month and share his internship story with you! Sahil’s passion for involvement beyond the classroom began in high school, where he participated in his first internship during a Digital Media class. He was selected to work on a special project for the Grand Prairie Reservation Council and discovered that he really enjoyed working in this capacity with an external organization. As a sophomore at UTSA, Sahil was adamant about getting a jump start on his career and secured his first college internship with Digital Marketing Sapiens which he found online at Indeed.com. There he was able to work with SEO, Social Media, press releases, etc. and see his work published. It was very rewarding! But after 6 months, his role shifted and he was moved to the sales team to sell company applications. It was there that Sahil realized that he wanted to explore new opportunities outside sales. After completing the semester, he resigned and pursued a vary different opportunity with TeamAbility which he was connected with through an alumni of his business fraternity. With TeamAbility, Sahil experienced marketing in a whole new industry–non-profit. Instead of marketing to sell products, he was marketing to raise awareness for children with disabilities. “It was an eye-opening experience and overall rewarding,” shared Sahil. He continued in his career exploration in a variety of avenues and industries. In February 2017, Sahil was appointed to be a Content Facilitator for Camp Mosaic, a summer camp that he previously participated in and volunteered with as a staff member. When appointed in this new role, Sahil proposed that he complete it as an internship and his request was accepted. As Content Facilitator, Sahil created curriculum for every area, interviewed over 110 applicants across 3 different cities, coached and trained staff members, and managed the camp budget. He supervised 130 camp participants grades 1-8th and 70 staff members for 6 days, to include risk management. “Going through this summer camp for 6 years as a participant and 6 years as a staff member had one of the biggest impacts on my life. It shaped me into who I am today and I was privileged to give back in that way,” shared Sahil. 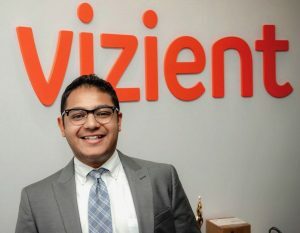 As Sahil continued to participate heavily in events on and off campus, he landed his final internship with Vizient, the largest member-driven, healthcare performance improvement company in the country. Once again, he found this opportunity through his network and began Summer 2018. As a Member and Field Experience Intern under Sales and Client Management, Sahil worked on a project to complete quantitative and qualitative analysis of the Marketing Campaigns through the Customer Relationship Management (CRM) software. He interviewed Client Executives, created reports on data analyzed, and provided recommendations.”The internship opened my eyes to a lot of possible routes even within the field I did not know even existed. I was able to really understand my strengths and areas of opportunities as well with the projects given,” Sahil stated. He also made a goal for himself to sit down with 50 team members to interview and network, which he successfully completed! Sahil continued to excel in his internship as he led and coordinated a community service event at a summer camp for the company’s serve day. “The most exciting part was learning new things everyday and meeting so many people. The CEO even came in to have lunch with the interns and we were able to meet so many great directors, AVP’s, SVP’s, and Executives. We had so much exposure from visiting clients, holding workshops, and meeting people that I felt like we truly got the full experience in such a short time,” shared Sahil. At the end of the Internship, Sahil won the Outstanding Intern Award with a $1000 scholarship! “This past summer I grew the most as a person and professional and I learned a lot about myself and the ways I still want to grow,” replied Sahil. Sahil was ecstatic to share his journey of career exploration. Each internship taught him something new, sharpening his skills and preparing him for the professional world. He continues to advocate the importance of networking and saying “Yes!” to all opportunities that come his way, and he has! Set these 3 questions/goals always! 1. What can I do here that will help me break boundaries and step out of my comfort zone? 2. What skills can I take away? 3. How can I expand my network? Always be ready to learn something new and never say no. Always keep a dairy as well! Keep track of who you meet and what you do! Also ASK FOR FEEDBACK! It’s always important to know what others see as areas of growth for you as well! If you would like to learn more about internship & experiential learning opportunities, visit the UTSA Career Center or schedule an appointment with your Career Counselor today!